According to the Bureau of Labor Statistics, slip and fall accidents are the leading cause of work-related disability and death among adults in the United States. Since workers' compensation is a no-fault system, injured workers are entitled to benefits for slip and fall accidents regardless of whether their own conduct contributed to the injury. A slip and fall accident is any incident where an employee is injured after losing his or her footing on a slippery or otherwise unsafe surface. 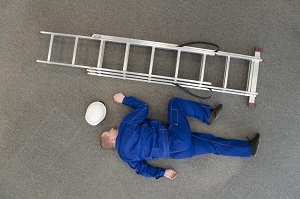 Slip and fall accidents can occur on the ground as well as stairways, steps, ladders, and elevated work platforms. Wet floors from snow or ice. Soapy floors from a recent cleaning. Highly polished marble, concrete, or ceramic tile floors. Lack of adequate hand railings. Exposed wires, hoses, cords, or tubing. Poor maintenance of outdoor walking surfaces. Injuries to the back, knee, ankle, and wrist are the most common after a fall, with a high number of workers injuring multiple body areas. Falls from elevated platforms or work areas are most likely to result in lasting disability or death. Workers’ compensation coverage begins your first day on the job, as long as your employer has three or more employees. Since coverage isn't dependent upon the number of hours worked, full-time, part-time, temporary, or seasonal workers are eligible for benefits as long as they establish that their injury occurred while they were performing their job duties. To maintain your eligibility for workers' compensation benefits, you should report your injury to your employer immediately. Your employer is then supposed to provide you with a list of approved physicians who can provide the necessary medical treatment. You must seek care from someone listed on the panel of physicians. You're not allowed to select your own care provider unless your employer either has refused to cooperate with your request for treatment or does not have a posted panel of physicians. Medical benefits cover the cost of treatment for on-the-job injuries. Temporary Total Disability (TTD) and Temporary Partial Disability (TPD) benefits replace lost income if you're unable to work or experiencing reduced earnings because of your injury. Permanent Partial Disability (PPD) benefits are payable to workers who experience a permanently disabling on-the-job injury. PPD benefits are payable after the worker is no longer receiving TTD or TPD benefits. Death benefits are available for the dependents of a worker killed in a slip and fall accident. In most cases, workers’ compensation coverage is the exclusive remedy an injured worker has to seek reimbursement following an employment-related injury. However, if your injury was caused by faulty equipment or safety products used on the job, you might be able to file a negligence suit against the manufacturer. Workers' compensation laws can be difficult to understand, especially when you're already feeling burdened by the effects of a work-related injury. Denials can also be a frustratingly common part of the process. One study found that roughly one-third of workers who eventually received a slip and fall settlement had their claims initially denied. If you're struggling to move forward with your workers' compensation claim, hiring a skilled attorney is a must. Rechtman & Spevak can help protect your right to compensation by advocating for your needs throughout the settlement process. Call today to schedule a free, no-obligation case review.